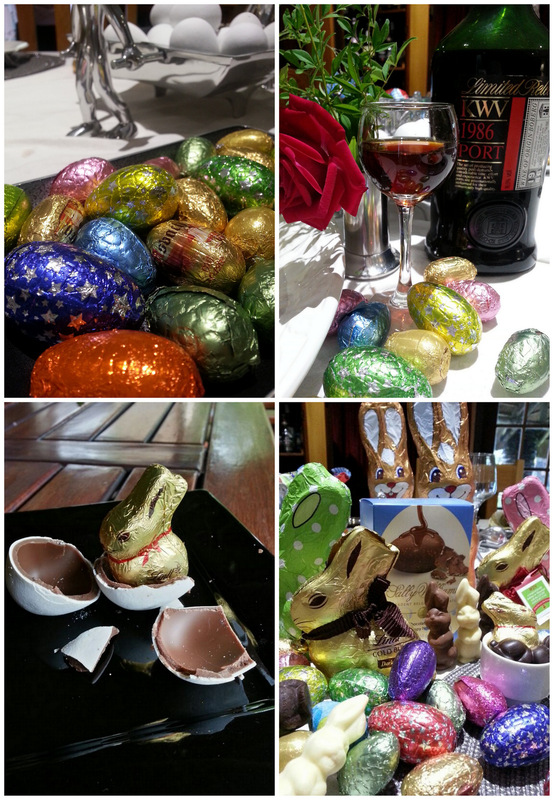 Easter was awesome, exhilarating, special and delicious. For me, as a Christian, Easter is the true new year. It is the period from Good Friday to Easter Sunday (when Christ was crucified and when he was resurrected). It is the most important and oldest festival of the Christian Church, culminating in the celebration of the resurrection of Christ (Easter Sunday) on the third day after his crucifixion at Calvary as described in the New Testament. He died on the cross to pay for our sins and allow us entry into God’s kingdom after death. His resurrection symbolizes the resurrection of all of us after death into Heaven, where our souls are very much alive and immortal in His eternal Kingdom. In short, his resurrection symbolizes new life. It sets Him apart from all the other historical figures in those times who claimed to be the Son of God because none of them came alive again after they died. This was a true miracle. Through doing this he proved that what he had been saying all along was true; every miracle he performed and everything he preached about God and the way man must live on earth was true. It renews your faith, this time of year, and for me it only cements it. You look again at the important lessons of the Bible and the Ten Commandments and re-commit yourself to living the loving Christian lifestyle. Satan will always be around to throw us off track and we need to be strong. Of course we will always sin, no matter how hard we try, because we live in a fallen world. What sets you apart is your repentance and prayers for forgiveness. God guarantees us He will always forgive us if we confess our sins and repent. Easter is the culmination of the Passion of Christ, preceded by Lent, a forty-day period of fasting, prayer, and penance which begins on Ash Wednesday and lasts forty days (not counting Sundays). The Sunday before Easter is Palm Sunday, with the Wednesday before Easter being known as Spy Wednesday. The last three days before Easter are Maundy Thursday, Good Friday and Holy Saturday (sometimes referred to as Silent Saturday). Palm Sunday, Maundy Thursday and Good Friday respectively commemorate Jesus’ entry in Jerusalem, the Last Supper and the Crucifixion. Easter is followed by a fifty-day period called Eastertide, or the Easter Season, ending with Pentecost Sunday. The week beginning with Easter Sunday is called Easter Week or the Octave of Easter, and each day is prefaced with “Easter”, e.g. Easter Monday, Easter Tuesday, etc. It is a very holy time for me. I really enjoy the service on Easter Sunday, before sunrise on the day of resurrection. The service is very early and I am not usually a morning person, but for this I am! The Easter Vigil is performed during this service. 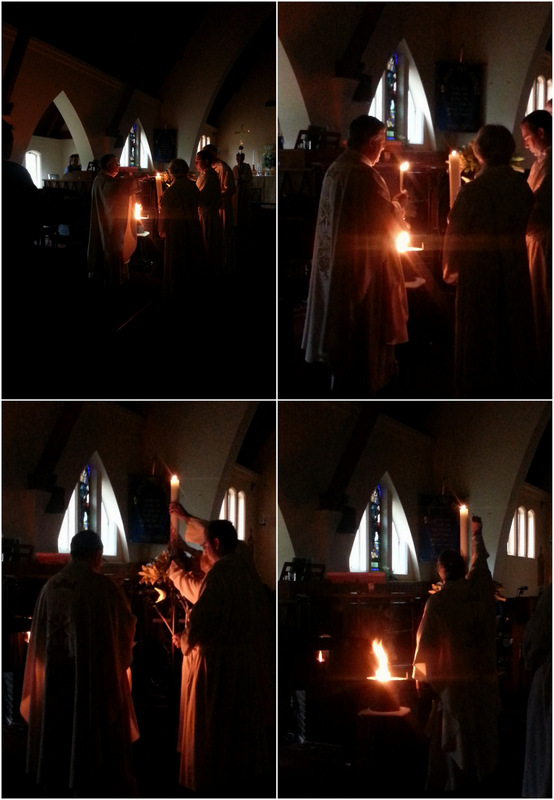 This is the most important liturgy of the year, which begins in total darkness with the blessing of the Easter fire, the lighting of the large Paschal candle (symbolic of the Risen Christ) and the chanting of the Exultet or Easter Proclamation. There’s something about the lighting of the fire and the candle that makes you feel reborn in a way. After this service of light, a number of readings from the Old Testament are read; these tell the stories of creation, the sacrifice of Isaac, the crossing of the Red Sea, and the foretold coming of the Messiah. This part of the service climaxes with the singing of the Gloria and the Alleluia and the proclamation of the Gospel of the resurrection. At this time, the lights are brought up and the church bells are rung, according to local custom. A sermon may be preached after the gospel. Then the focus moves from the lectern to the font. Anciently, Easter was considered the ideal time for converts to receive baptism, and this practice continues within Roman Catholicism and the Anglican Communion. It is traditional for the congregation to renew the vows of their baptismal faith at this point. The Easter Vigil concludes with the celebration of the Eucharist (known in some traditions as Holy Communion). Here is something interesting I found: The first recorded “Sunrise Service” took place in 1732 among the Single Brethren in the Moravian Congregation at Herrnhut, Saxony, in what is now Germany. Following an all-night vigil they went before dawn to the town graveyard, God’s Acre, on the hill above the town, to celebrate the Resurrection among the graves of the departed. This service was repeated the following year by the whole congregation and subsequently spread with the Moravian Missionaries around the world, including Old Salem in Winston-Salem, North Carolina. How about you? How was your Easter? How did you celebrate? 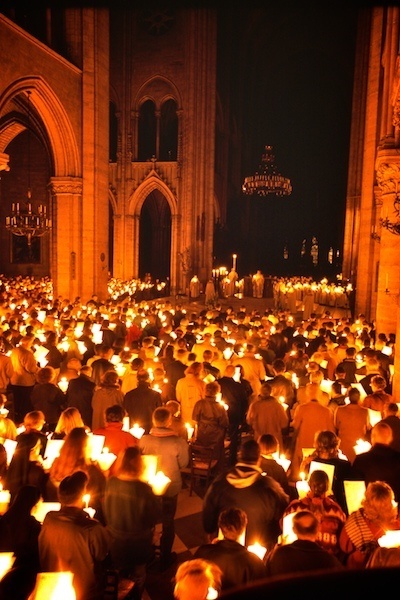 Here is a gorgeous photo I found of the celebration of the Easter vigil at the Cathedral of Notre Dame, Paris. I have to say I do miss going to a sunrise service on Easter. That’s one thing our church doesn’t do. The church I used to belong to had one at a local beach. We would all gather before the sun came up. Very special.